A meal fit for a princess! 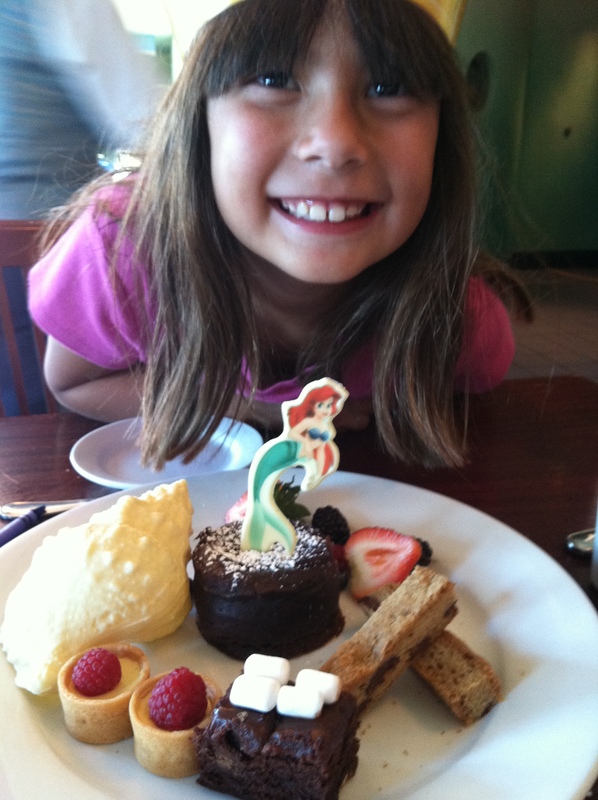 When she was younger, my daughter’s absolute favorite place to eat at the Disneyland Resort was Ariel’s Grotto at Disney’s California Adventure. A wonderful combination of both great food and character dining (breakfast and lunch only), this is probably the best place to eat for any child who loves the Disney Princesses. Most character experiences are with Disney’s “silent” characters. They come to the table, mime for a bit, hug the kids, pose for pics, and move on. But since the princesses are all “face” characters, the kids get a chance to interact with them in a way they don’t always get to with the others. Each of the princesses take their time with the kids, often bending down to their level and treating them like royalty. They pose for photographs, sign autographs, and really talk to each child. Is the meal more pricey? Sure. But for a good sit-down meal with a chance to meet the princesses without waiting in a long line – it’s WORTH it! Of course, each group gets to meet the main attraction – Ariel! As you walk in and before you get to your table, you meet Disney’s mermaid-turned-princess herself. And the folks here are great about letting you take whatever pictures you want. They not only will take pics of your party for purchase later, but will also take pics with your camera, too. They do offer photo packages which they come by and present while you eat (amazing how they can do that), but you are never under any obligation to purchase. If you do, it just gets added to your meal ticket. Ariel will spend time talking to your child while signing their autograph book, and if they don’t have one, will talk to them anyway. After taking a pic, you are escorted to your table and already the excitement begins as you notice the princesses wandering around the dining room. Today, the menu is different, but when we went our meal began with an antipasto trio of plates. The bottom tier was a wonderfully light salad, the middle tier was filled with fruits and a small Jello treat, while the top tier was laden with deli meats, cheeses, and olives. I think now you’re only offered your choice of soup or salad. You are also served a pinwheel bread basket with a trio of different toppings to lather on top. Unlike other character experiences which are mostly buffets, this one is all table service and there is a broad selection to choose from. When we went, the menu included Santa Maria tri-tip, pasta with Italian sausage, cioppino, herb-crusted chicken breast with cheddar mashed potatoes, and spinach and ricotta agnolotti (like ravioli soup). Kids had an equally varied menu of choices including seashell pasta, meatball lollipops, chicken on a stick, and kid’s version of tri-tip. Today, the kids menu is different, but still a variety of fun choices. Since we’ve been multiple times, I’ve had the tri-tip which was excellent and the agnolotti which admittedly was only okay. Ravioli soup just isn’t my thing, but it was still filling and tasty. Emma has had the seashell pasta both times and wiped it out she loved it so much. The end of the meal comes with a dessert plate – not a dessert, but a dessert PLATE. An assortment of goodies comes out to you and all are yummy. The first time we came there was a white chocolate conch shell which was out of this world along with other treats. The second time, there was a lava cake with colorful cupcakes, cookies, and fresh berries. Still quite yummy, but we did miss the themed white chocolate conch shell. After our first visit in 2011 they never served the white chocolate conch again! Back then our table received one plate for sharing. Now be warned that the Princesses only come out in the day. The menu at lunch and dinner essentially remains the same, but the experience changes. At night it becomes a premium World of Color meal location (at a higher rate also) with no Princesses. So if that is important to you, come for lunch. They do offer a Princess breakfast but with a different menu. The food is high quality, the service is great, and the meet-and-greet time with the Princesses is priceless. Oh, and everyone gets a button! 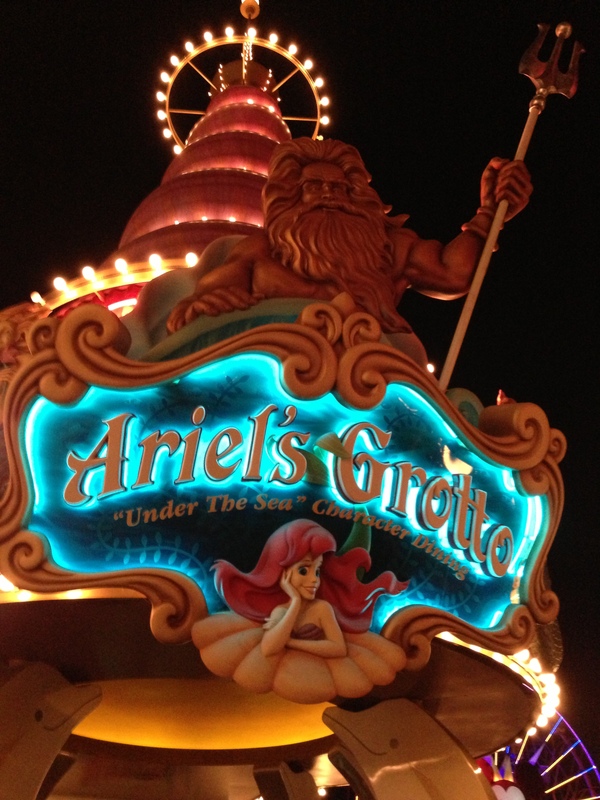 Come to Ariel’s Grotto for a great in-park dining experience! Disney tip: Make reservations early! But if you don’t, show up right when they open and they will take stand-by diners. You may have to wait a little bit, but the wait is reasonable and worth it! Another fun spot to grab a small bite is next door at Cove Bar!